Easter bunnies, chicks, and eggs. My mother in law is German. She owns all sorts of little figurines and symbolic pieces that she takes out according to her mood and/or the season. This week is featuring Easter bunnies, chicks, and easter eggs. 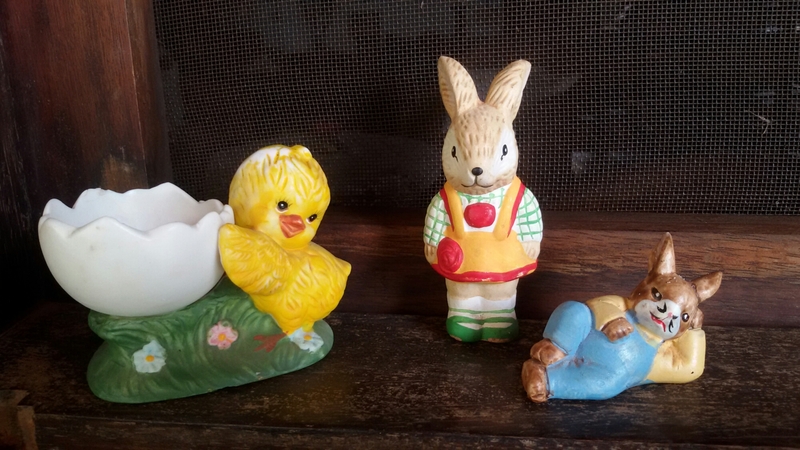 Seeing her dainty placement on this window sill made me wonder about the origin of the Easter bunny in association with Easter. The Easter bunny originated in Germany and was originally associated with Ositara (or Eostre) a goddess of fertility. Eostre was associated with fertility and rebirth with her presence being felt especially at this time of year I.e. spring. When the rains came down, flowers and trees bloom, and nature presents fresh new beginnings. Bunnies, Eggs, and newborn chicks symbolise fertility and, as time went on, newer Christian traditions presented the Easter bunny as bearing brightly colored eggs, chocolate, and other gifts for children who had been on their best behaviour.